There are some speculative fiction books that are so deeply rooted in an author’s unique vision that reading them becomes a sink or swim exercise. Yoon Ha Lee’s Ninefox Gambit is one of these books. The opening chapter reads like military science fiction, but most of the familiar elements of that genre are missing. Instead is a world of mathematical exotic warfare and humanity divided into a number of different factions. Heretics in this universe fight against the order of the hexarchate, tied to a specific calendar and the shared observances associated with it. Ninefox Gambit is a bold and unique vision but not for the fainthearted at any level. The protagonist is Kel Cheris, an army captain promoted to General when she agrees to host the spirit of the long dead and possibly psychotic general Jedao. Jedao has never lost a battle but was interred in the “black cradle” after one famous victory when he turned on and killed all of his own troops. Cheris becomes the “anchor” for the spirit of Jedao, and his personality sits in the back of her head, advising her and to some extent controlling her. Even for this society this is a desperate measure, born out of a need to root out a group of heretics who have taken over a key space station and instigated “calendrical rot” which, if spread, could bring down their society. This is military science fiction at its heart so the focus is often on the battle for the space station and Cheris’s growth as a military commander under the guidance of the ruthless but effective Jedao. As a result it is often shocking and violent . And all of this manoeuvring is filtered through Yoon Ha Lee’s weird, mathematical and calendar driven world down to the bizarre weapons with descriptive names like the chrysalis gun, carrion bomb, amputation gun and the winnower. But Ninefox Gambit has more going on than just the surface battle. There are actually two fascinating and complex characters in the middle of it all and Lee does not lose sight of either. Cheris, coming to terms with command but also realising that nothing she knows is quite what it seems. And Jedao who for much of the book is the hectoring voice of experience in her mind but who’s backstory emerges later in the piece. This is not science-fiction for everyone, not even for all science-fiction fans. Ninefox Gambit is science-fiction that requires a commitment to dive deeply into a reality that is only tangentially like our own. There is no easing in and the early going can be disorienting and off-putting. But Yoon Ha Lee confidently delivers full immersion in his universe and fascinating characters. 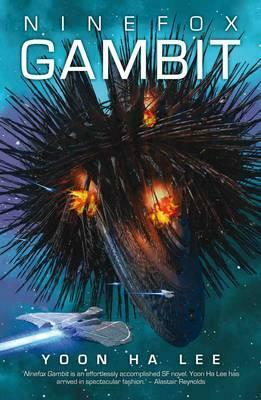 Ninefox Gambit is the first in a trilogy and so in one sense this volume is mainly table-setting. Now the table is set, it is fascinating to contemplate where this series will go next.